I have seen two pics of it. One is from a test match and one is an Australia-Zimbabwe ODI which came in Wisden. Can any one conjure up the pics? My cousin wants to see them. Also, would be nice to discuss occasions this has happened. 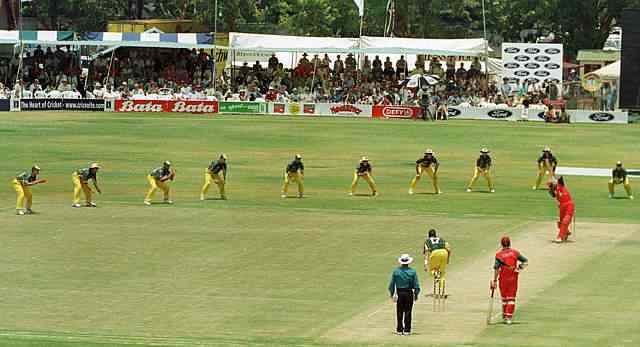 I can't find the latter pic at the moment but if it helps it was Damien Fleming bowling to David Mutendera in the Second ODI of that 1999/2000 series. Last edited by Richard; 10-02-2010 at 04:30 PM. I'm sure I read once that Lillee asked for that field because he planned to use the ensuing photo on the dust jacket of a book he was working on. I believe the batsman was tailender Peter Petherick btw. Also, would be nice to discuss occasions this has happened. Coverage of the Aus-vs-Zim game is, not surprisingly, not extensive (CricInfo was still a year or so away from fully covering every tour and this was a minor one; Wisden ODI reports are never particular priorities). From what little I know Zimbabwe were nine-down, Fleming was bowling brilliantly (finished with 10-14-3 - 3 wides and a no-ball), Mutendera survived for a little longer than expected (actually finished-up being dismissed by Andrew Symonds of all people), and Stephen Waugh just gradually brought the field up. Yeah, I remember Waugh brought one man at a time up at least the last few fielders. Or that's what I recall. I could be wrong as memory is very vague. While I love seeing it, it's not the ideal fielding setup even for hat tricks where you don't care about runs at all, as a few other catching positions will probably give you a better chance of a wicket. Still an awesome sight though - the DK Lillee picture is one of my favorites in cricket. I somewhere read it was Hamilton Mazakazda who is facing that delivery. Did either of those end in a wicket? The Fleming-to-Mutendera one definately didn't, because as I say Mutendera actually lasted a little while and ended-up being dismissed by of all people Andrew Symonds. Not sure about the Lillee-to-Petherick one. I'm not sure if there were nine, but I do remember an awful lot of slips when Harmison got his 7 for 12 at Sabina Park. I think he got his last 2 wickets with a massive slip cordon. However, iirc, both dismissals were caught by first or 2nd slip or so. Last edited by Stapel; 11-02-2010 at 03:10 AM. Now - how would you describe that field using fielding postions..? Harmison always had a short leg when bowling well. Wonder why their is a restriction of no more then 5 fielders on leg side? Whats the reason for that law? Top five Slippers (slip fielders) you've seen..